Tiny houses are the popular thing for people downsizing to minimalist living. The downside is a tiny kitchen. If you like to cook often, this could be a problem. People have various reasons for moving into tiny homes. One reason that I want to discuss, aging, affects folks differently. Eventually, if you live to a ripe old age, you’re going to need some help one way or the other. And the older you get, you realize how much less you need material things. Downsizing begins to look more appealing. Seniors are faced with where to live as they age. Many people choose to move into an assisted living facility. Others decide to stay in their homes, especially if they have family nearby to check on them. A few have the privilege of living with children who care for them. Moving into a tiny house is another option. Countryliving.com shows adorable tiny homes that “maximize function and style”. Consider this as a possibility if you are a senior needing to downsize. My mom and dad were involved in full-time ministry and had two homes. One was the parsonage, and the other was a house they built in a country community where they had both grown up. The house accommodated them, their children, and grandchildren. They wanted a place where all the family could come home to during holidays and whenever they could come for a visit. My mother passed away in 2008, and my dad died last November. Lately, my brothers and I have been tending to the country home and the belongings of our parents. Part of what I had to do during this time was to move things that belonged to my husband, our daughters, and me out of the attic. Due to our past RV lifestyle, we had stored our things there. Let me tell you, I am convinced since moving our things from the attic that we can live on MUCH less than what we realized. I was amazed at all the stuff we kept. Let me tell you, I am convinced since moving our things from the attic that we can live on MUCH less than what we realized. I was amazed at all the stuff we kept. What’s this got to do with tiny house and minimalist living? My attic experience of sorting through boxes in my parents’ attic on a humid, hot summer day made me think seriously about minimalist living. Think about this. If you store boxes of things you CAN’T live without in an attic and those things stay there for years, you LIVED without it. Are you paying a monthly storage fee to have a place to put your boxes of junk? Yes, my day in the attic got to me. In a good way. I threw so much junk away. There were treasures as well – like the dishes I saved that I wanted to use again. They were worth saving. Moving boxes out of a storage unit or an attic can do a person a lot of good. You begin to realize that material goods are just stuff. We don’t take those things with us when we die. On the other hand, we leave things for our children and grandchildren (like my parents did). Treasures are precious, especially the kind that have sentimental values. In her later years, my mom went through a major phase of “spring cleaning” and asked her youngest sister to come help her. While my aunt helped me recently in sorting through my parents’ things, I noticed that there was not a tremendous amount of junk. My aunt said that my mom and dad had thrown away boxes and boxes of stuff and taken the rest to Goodwill. Somehow, Mother must have known when she had that final cleaning phase that her time left on earth was short. She was not a packrat and hated clutter. She didn’t want her home to ever look untidy. I’ve had my share of small kitchen living in an RV for ten-plus years, and I didn’t mind it at all. Before my family and I began the RV lifestyle, I experienced the feeling of restlessness whenever I visited two of my best friends’ homes. Their homes were like getaway places for me because I managed a mobile home park and lived on the property. Then things began to change. I would go over to see my friends and ask myself if decorating and redecorating over and over was what I wanted. Gradually, I realized that having a house to fix up was not what I desired. During this time, my husband and I decided to go full-time in his ministry which required living an RV lifestyle all year long. A lady asked me once if it was hard for me to not have a home. I could honestly tell her no and shared about the changes that had happened to me. Before moving into the RV, we had come so close to paying earnest money on a house. The real estate guy had booked another appointment immediately after ours and was in a hurry (real estate agents, beware when you get in a hurry). We felt rushed and asked if we could have a moment outside before making the final decision. The agent grudgingly agreed. We walked outside and quickly decided that we had doubts. We didn’t purchase the house and later was thankful that we didn’t. Soon after that, we moved into our RV and started our new, exciting journey. 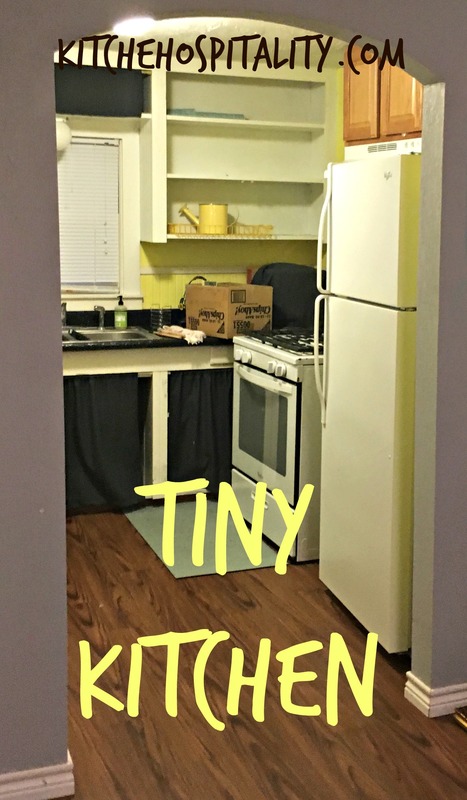 Now my husband and I have a house (not exactly tiny) with a tiny kitchen (I think my RV kitchen had more room than this one). 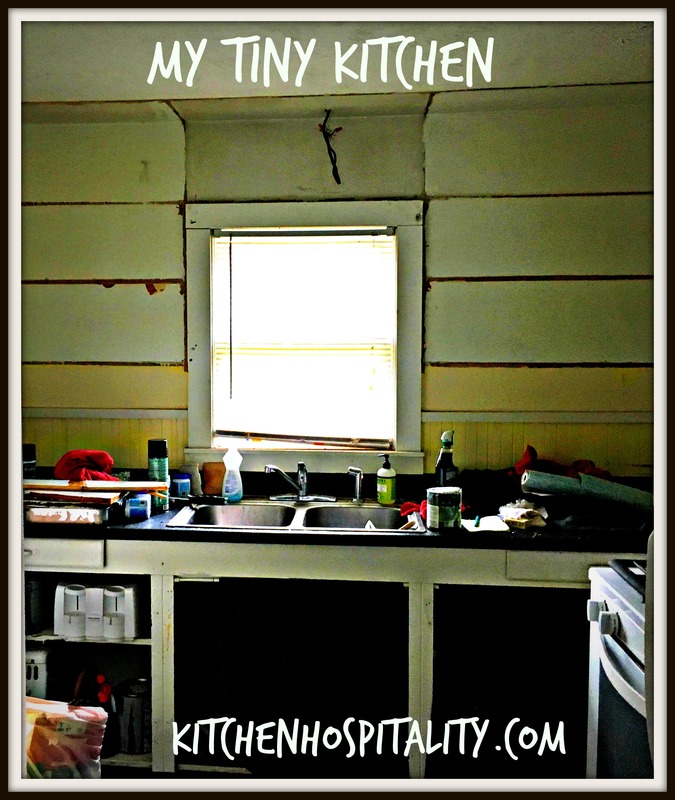 It’s a cute place with personality, but that kitchen! The cabinets have no doors. A previous resident had put black curtains up which made the kitchen look even smaller. Curtains can really look cute in a kitchen, but those black ones had to go. 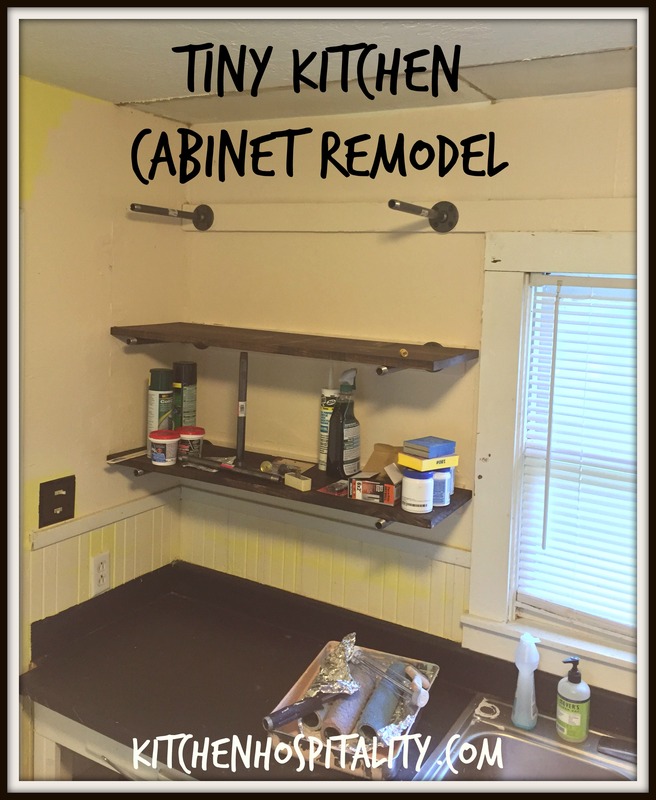 My son-in-law has building experience, and he agreed to help with our tiny kitchen cabinet problem. He tore the upper cabinets down (no doors on them either) and started a farmhouse style open cabinet look with pipes. It’s coming along great, and I’m so excited! You can see that our kitchen cabinet project isn’t finished, but look at the progress. 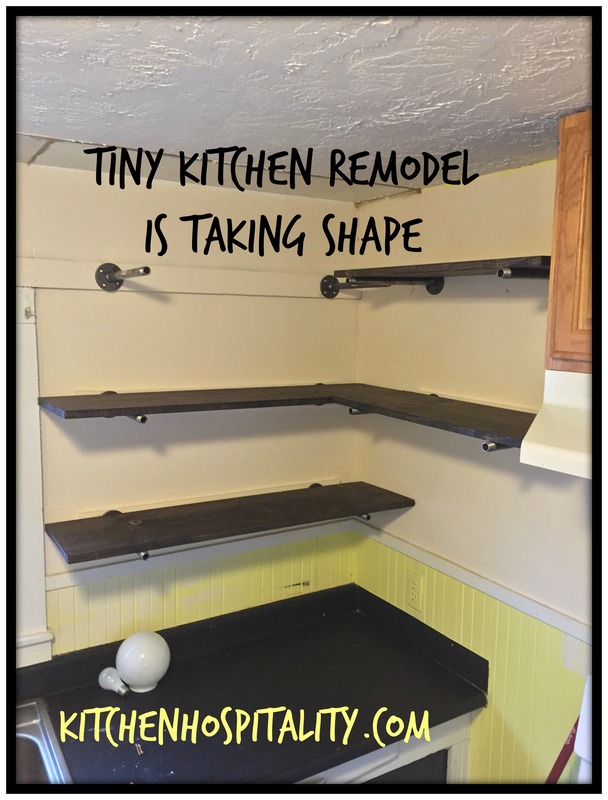 So what would you do with the bottom cabinets? Put new doors on? Different curtains? I haven’t decided yet about them, but at least the top cabinets are taking on their new farmhouse look. When the project has been completed, I’ll let you know how it turned out and post new pictures. Living in a tiny house has some good points. It’s easy to clean, doesn’t cost a lot, and has lower utilities. You can save money this way. Then you’ll have extra funds to travel or do other things you couldn’t afford to do before. What would you do with the extra money saved by moving into a tiny house? Want to share? Leave me a comment. It’ll only take a minute or two. Thanks so much for coming over to my blog today. Enjoy the rest of your day! Downsizing to a smaller house can be good for older adults, but one needs to be aware of the width of hallways and doors to be sure that if a wheelchair is needed, it will still fit into the bathroom. Of course, there are some large houses that have doors that aren’t wide enough, too. Interesting change in the kitchen. Will those pipes be capped? That is true and something most people don’t think of – until they age. The pipes will be vertical (they’re incomplete and won’t look like they do now) and won’t need to be capped.